Leah and I arrived home from a school retreat on Friday, and our mom bought some cupcakes, a very rare occurrence in our house. They were lemon with raspberry frosting and quite delicious, although we ate so much junk at the retreat that cupcakes weren’t the best choice ever! Our little brother dropped his on the floor (frosting went on the wall and into a heating vent, in case you were wondering) and became very sad afterwards. He requested we make cupcakes the next day, and we did, but with a lime base and strawberries since those are what we had in the fridge. Go figure, he refused to eat the icing, but we can assure you that the icing is delicious. Henry just has fruit issues sometimes! These cupcakes are in the top 10 ever. The cake is very tender and fluffy thanks to both yogurt and six beaten egg whites in the batter. The batter was time-consuming to make since we had to separate eggs, zest/juice limes, and beat egg whites into a meringue but the results were more than worth it. The frosting is airy and light with lots of fresh strawberry flavor. This is the ideal summer cupcake, playing off of the margarita flavor combination but minus the alcohol. 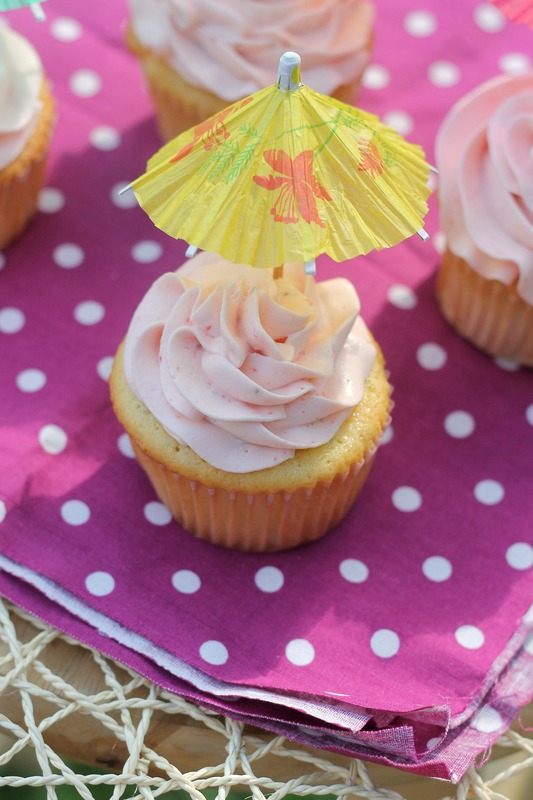 We had some fun little umbrella toothpicks that we topped the cupcakes with for fun accessories. Bring these to any sort of gathering this summer and we can bet they will be a hit! Preheat oven to 350°F . Line muffin pans with cupcake liners. In the bowl of a stand mixer fitted with the paddle attachment, cream butter and 1 cup (200 g) of the sugar on medium high speed until very pale and fluffy, about 5 minutes. In a medium bowl, sift together flour, baking soda and salt. Set aside. Lower mixer speed to medium low and add the egg yolks, one at a time, scraping the sides of the bowl with a spatula after each addition. Add lime juice, vanilla, and lime zest and beat until combined, about 30 seconds. With mixer running, add dry ingredients. Add yogurt, scraping down the sides of the bowl to make sure everything is well mixed. In another grease-free bowl, whip egg whites and remaining cup of sugar on medium high speed until they reach stiff peak stage (this will take 5-10 minutes depending on whether or not you use a stand mixer or hand mixer. We used a hand mixer, and it took a little bit under 10 minutes). Fold meringue into batter until just combined, and divide batter evenly in the muffin pans. Bake cupcakes until a tester inserted in the center comes out clean, about 25 minutes. Let cool in the pan for a couple minutes, and then transfer to a cooling rack and let cool completely. In the bowl of an electric mixer fitted with the paddle attachment, whip butter for 8 minutes on medium speed. Butter will become very pale and fluffy. Add remaining ingredients, except strawberry puree, and mix on low speed for 1 minute, and then on medium speed for 6 minutes. Frosting will be very light, creamy and fluffy. Add strawberry puree and mix until incorporated. Fill a piping bag fitted with desired tip and frost each cupcake (we had just barely enough to frost 25 cupcakes doing the full swirl, and we were able to lightly frost the others). Serve and enjoy! 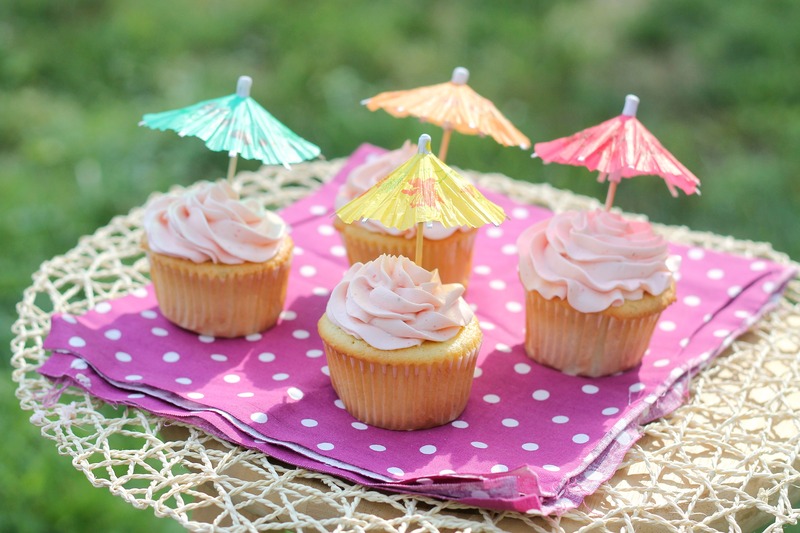 Note: The cupcakes can sit out for about 6 hours at room temperature, but we recommend refrigerating after that or refrigerating after an hour or so if it’s very hot out. The cupcakes are good for about 2 days. Thanks so much! I actually left a comment on your post about it. Thank you for nominating us :).